Given the rapid growth of the industrial additive-manufacturing industry, it has become increasingly difficult to keep track of all of the machines and materials on the market. 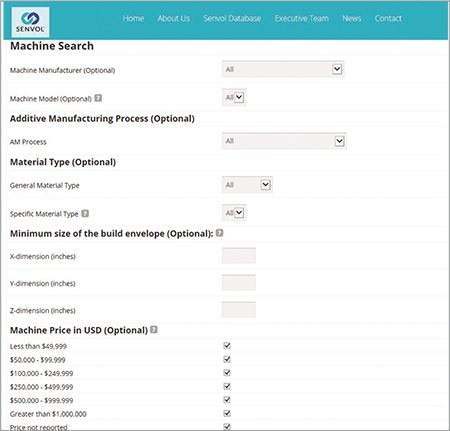 Senvol reportedly has solved this problem with the launch of the Senvol Database, where users can search more than 30 fields including machine build size, material type and material tensile strength. The sheer quantity and dynamic nature of the search fields enable users to search in unique ways and to quickly get the information they need. The database can be useful to potential machine buyers, and engineers searching for materials by specific material properties. It contains detailed information on more than 350 machines and 450 materials. Described as an “additive-manufacturing information goldmine” by 3Dprint.com and a “one-stop shop for 3D printers and material specs” by Gartner, the Senvol Database is online and free to access.